Eddie Jones has been delayed in taking up office as England head coach because he is waiting for a work visa. Jones, appointed as the replacement for Stuart Lancaster on 20 November, was scheduled to begin work on Tuesday. The Australian has been able to start carrying out his duties, but is having to do so from Tokyo because his visa application is still being processed. Rugby Football Union officials hope that Jones' paperwork will be approved before the end of the week. 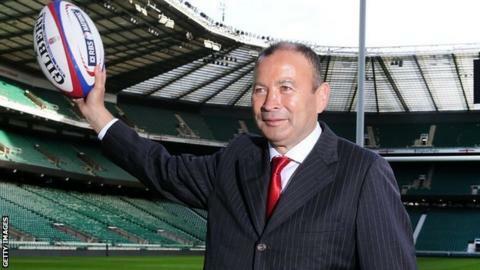 Jones, who coached Japan at the recent World Cup, was able to attend a press conference at Twickenham on the day of his appointment because he had a visitor's permit to enter the UK. The 55-year-old then travelled to Los Angeles to carry out work for World Rugby, the game's global governing body, at a conference for tier two nations, before returning home to Japan, where he has been waiting to be granted a visa. To take up the England job, he left his role as head coach of South African franchise the Stormers - who he only joined in September. Before that, Jones led Japan to a shock victory over South Africa at this year's World Cup, having guided Australia to the 2003 final before helping South Africa win the 2007 tournament by working as their technical director.